Home / CSS / Developer / Font / Font Formatting / HTML / Programming / QA / Testing / text / Troubleshooting / Website / Test page for copying and pasting text with multiple text colors, sizes, fonts, highlights and styles. Test page for copying and pasting text with multiple text colors, sizes, fonts, highlights and styles. This webpage is used for testing purposes only. It is used to see how well you can copy this text and paste it into other environments. This text has multiple different sizes. This text has multiple different colors. This text has multiple different styles. This text has many different fonts. This text has many different highlight colors. 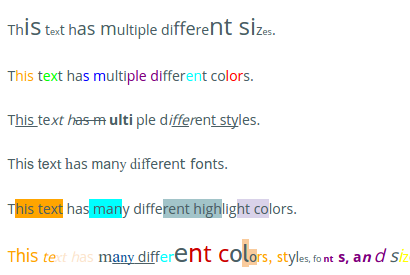 This text has many different colors, styles, fonts, and sizes and highlight colors.